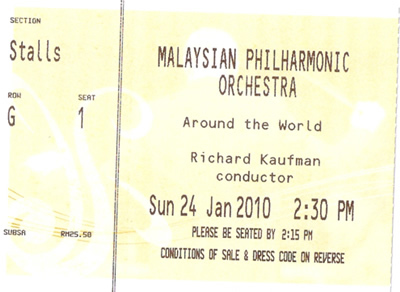 Yesterday, Sunday January 24th, my wife and I took our kids to a concert by Malaysian Philharmonic Orchestra. It was the second time J and K went to concert. The theme for the last Sunday’s concert was Around the World. This session was specially for children and it was called Family Fun Day. I was surprised to see that the hall was full and happy to know that many parents are exposing healthy activities to their children. After the concert, my wife asked them both if they wanted to come again for another round of concert, the replies were mixed. J said she would like to go again but K’s reply was negative. As for me, I love it! There were a few touching moments in that concert and I was so touched by the beauty and inspiring music that was performed by the orchestra. It was like the “aha” moment or reconnecting with self or something like that. We should go to concert more often. If you are subscriber, you have the privilege to enjoy discounted prices for your tickets. Through our friend, CC, she managed to “network” with her friend’s friend (who is a subscriber) to get tickets at RM25.50 each. The original price is RM30 per person.